Well, we made it up to Ciudad Valles with no accidents. 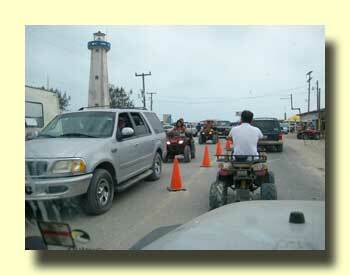 The Semana Santa traffic was terrible. Lots of folks in a hurry to get to the beach. Now we're inland and things are much quieter. The pools here are doing pretty well during the holidays. Apparently not everyone has gone to the beach. Still, El Banito is very laid back, and everyone but us and the one other rig sharing the park with us leaves in the evening. Yesterday evening we visited the restaurant for our annual French fries fix. Had a chance to say hi to the local rancher who seems to come by every evening for a big steak. He always sits at the same table and watches a quick telenovela before heading out again. 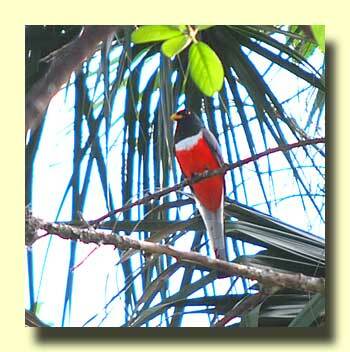 Two years ago when we visited we realized that El Bañito is also one of the best bird-watching RV parks in Mexico. While having cocktails we heard a strange noise over our heads. Looking up we spotted a Trogan patiently waiting for attention on the branch over our heads. He had no sooner flown off than we followed a soft hoo to a Pygmy Owl perched just a few feet from where the Trogan had been. 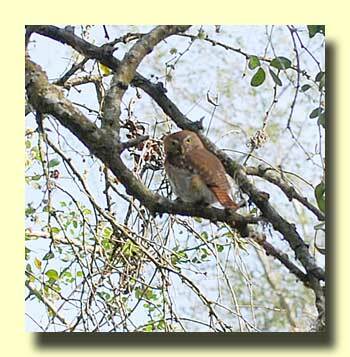 This year the Pygmy Owl was back but we had to walk the golf course across the street to see the Trogan again. It's been two weeks since we visited the doctor in Chetumal to have the stitches removed from Terri's elbow. The doctor there told us to have the elbow X-rayed one more time before we headed into the States to make sure things were healing properly. We were a little concerned about getting the job done, particularly during Semana Santa. It took us less than two hours to find a doctor, make an appointment, get the arm X-rayed, and have the doctor take a good look. And it cost $60. Obama may be on track for reforming the medical system in the US, but it's hard to see how he's going to compete with Mexico. Oh yes, the doctor was enthusiastic about the elbow and how it's doing. He says Dr. Carlos in Campeche did a great job. We couldn't resist driving out to La Pesca to see the Semana Santa beach mayhem for ourselves. Actually, the road out was pretty quiet. When we arrived we found that the roads were only quiet because everyone was already at the beach. Now that so many people in Mexico have cars, parking at places like this can be a nightmare. The closest spot we could find was over a half-mile from the beach. It didn't take long before we headed back to Ciudad Victoria - all by ourselves. 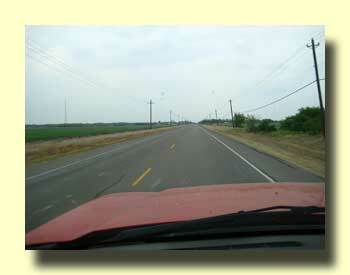 We crossed back into the US on the Free Trade Bridge between Los Indios, Texas and Lucio Blanco, Tamaulipas. Had to wait for one car, not much of a line. We can't get over how friendly and professional the US customs agent was. He asked the right questions, took a look in the back to make sure we had no unauthorized passengers, and sent us on our way feeling pretty good about how the US is handling the border. However, as always, things seem pretty dull back in the USA. These roads are so wide and smooooth.